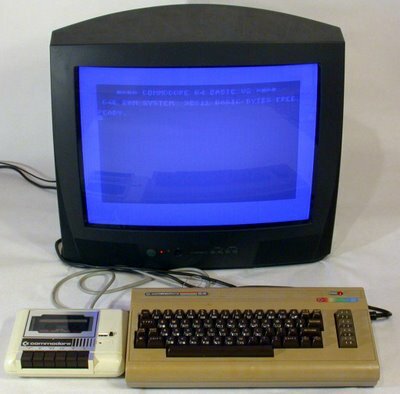 I still remember my Commodore 64. I used BASIC to build a starship Enterprise and create a star field behind it. Then my starship went sailing through the star field, starting at a different height on the screen each time because of a random number generator I’d entered into the code. Later I had the starship randomly visit various randomly generated stars, discovering what kind of star it was only after arrival (I guess the viewscreen must have been out). Sometimes the star was actually a BLACK HOLE, which caused the whole program to end with a dark screen. I saved the whole program on my tape drive and then I could reload it any time I wanted. Pretty spiffy. That’s about as far as my computer education went. So you shouldn’t expect much from me regarding quantum computers. David Deutsch (who is a renowned pioneer in the field) has an entire chapter in The Fabric of Reality on quantum computers. Colin Bruce talks extensively about them in his book, as well. And the truth is after reading these sections again and again I still have no idea how quantum computers actually work. Right now I’m working my way through a series of six lectures by David Deutsch on quantum computation; they’re intense and mathematical, but I’m not without hope. Anyway, the actual operation of a quantum computer is not really the point of this blog entry, so I’ll just do some handwaving. The essential idea is this. A classical computer is made of bits which can hold a value of either 0 or 1. To increase the power of the computer, you increase the number of bits. A quantum computer doesn’t use bits, but qubits. These can also be 0 or 1, but also can be a superposition of these two values. This essentially gives the quantum computer hugely more computational power, because it can use all these different possible values in its computations. As Deutsch pointedly says, the quantum computer is a fundamentally multiversal device, because all these values of the qubit occur there. To work effectively, the qubit must be isolated from the rest of our universe. The result is a multiversal object, existing in a quantum interference superposition, calculating away in a huge number of histories, until the interference is canceled and the qubit recombines in a single history (our history), its calculation complete (this is the handwaving part, as I’m not at all clear how this actually happens). One particular calculation that Deutsch discusses is the factorization of 250-digit numbers using something called “Shor’s Algorithm.” Shor’s algorithm can factor numbers using quantum processes in a matter of minutes that would take millions of conventional computers millions of years to factor. The quantum computer would need to complete only a few thousand calculations in each history, but it performs these calculations not in one or even a few histories, but in the staggering number of 10^500 histories! As Deutsch says, “Where was the number factorized? There are about 10^80 atoms in the entire visible universe, an utterly miniscule number compared with 10^500. So if the visible universe were the extent of physical reality, physical reality would not even remotely contain the resources required to factorize such a large number. Who did factorize it, then? How, and where, was the computation performed?” (Fabric of Reality, page 178). Of course, quantum computers do not yet exist in anything like the form needed to factor these large numbers. But when they do, Deutsch’s challenge will still be there. If not via many worlds, then how do quantum computers work? The point I’d like to make about quantum computers, though, is this. Many worlds is still seen by many physicists as mathematically useful fiction, or worse. The same used to be true of the heliocentric theory, field theory, atomic theory, quark theory, and many others. Each time the theory was taken seriously, instead as just a fiction, tremendous progress resulted. David Deutsch isn’t the only physicist who has done important work on quantum computing, of course, and not all those physicists themselves accept many worlds. And yet . . .
Deutsch makes the point in Beginning of Infinity that the “shut up and calculate” school of quantum mechanics and the Copenhagen Interpretation that spawned it are particularly bad philosophies not because they’re wrong, but because they make criticism taboo. The tradition of criticism that led inexorably toward better explanations, including heliocentric theory, electromagnetic field theory, atomic theory, and so on also led to the technologies that we’ve used to transform the world. Might the final rejection of “shut up and calculate” and the restoration of a tradition of criticism lead to a similar explosion of new knowledge? Could quantum computers be just the beginning of the advances we might make if we take many worlds seriously? Could many worlds, like all those “mathematical fictions” that came before it, be the better explanation that leads to our next great transformation? Now I’ll take a look at some of the weirder possible consequences of many worlds. Worst logic in 10 to the 500th history. Mike thought it was absurd that his wife might be cheating…but she was. Same with Dave…..so your wife must be cheating on you. Great reasoning. If something sounds utterly ridiculous. ? It will turn out to be true.. This logic shows how weak and pathetic your argument is. Hi again Joe. Thanks for another comment. This isn’t logic. It’s conjecture. Read Beginning of Infinity and you’ll see that all our ideas come from conjecture and criticism. Maybe quantum computers won’t work. Could happen. But if they do, then we’ll have another example of how taking “useful fiction” seriously has advanced science. Might work. Might not. We’ll see.